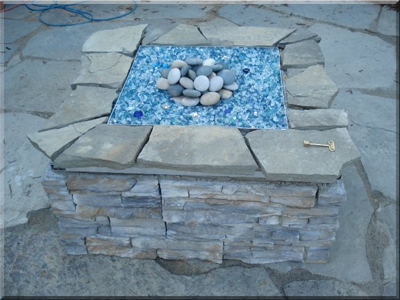 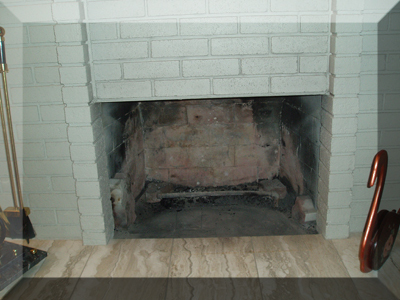 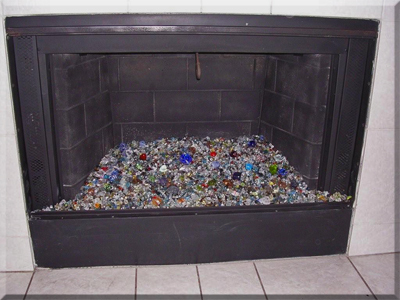 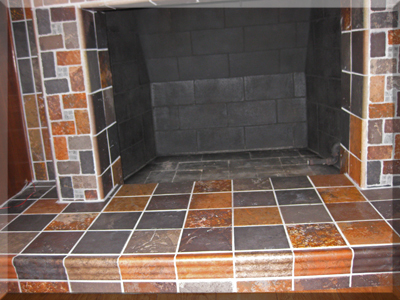 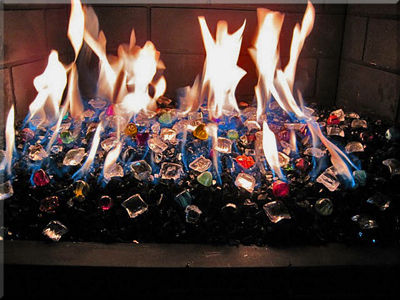 The fireplace pictures below are with Blue Green base FireGlass and Blue Green FireGlass. 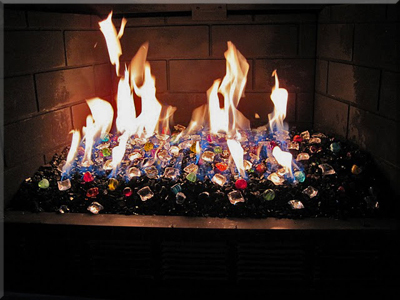 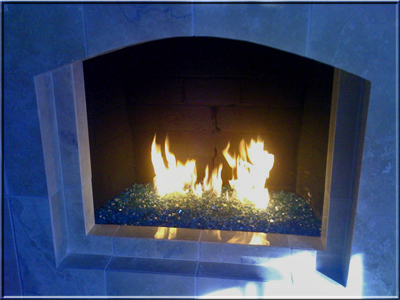 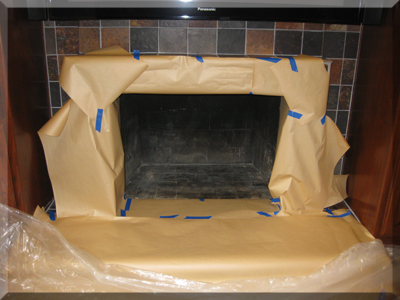 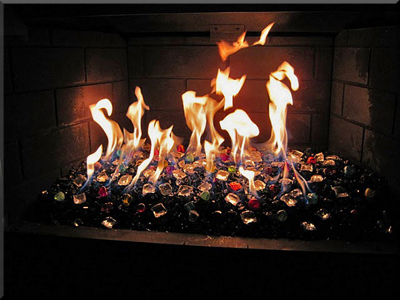 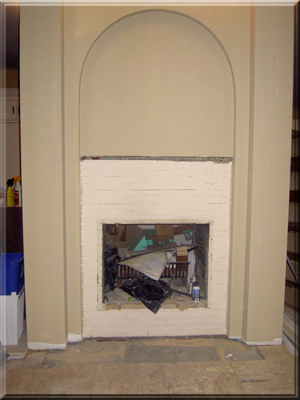 Marla installed the Blue Green base glass and Blue Green Reflective Fire Glass in both fireplaces. 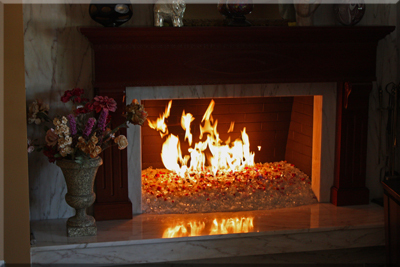 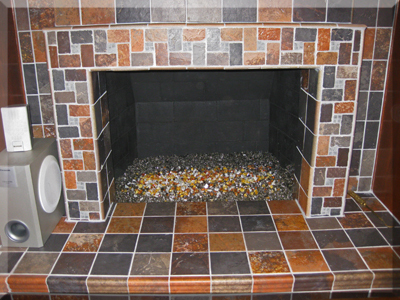 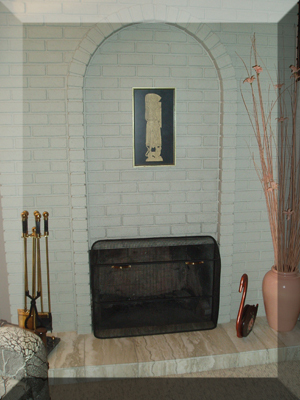 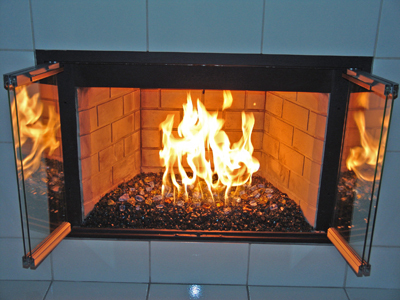 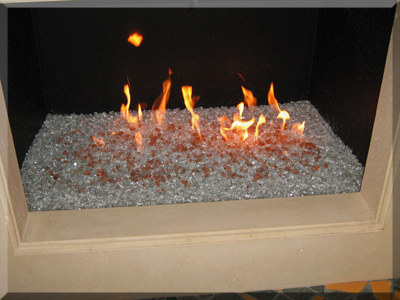 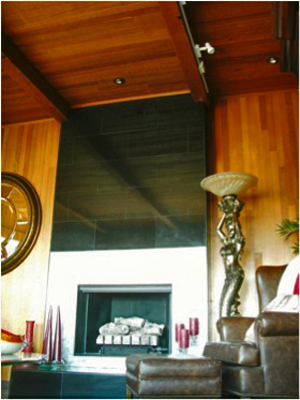 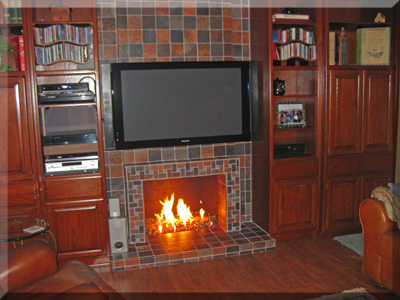 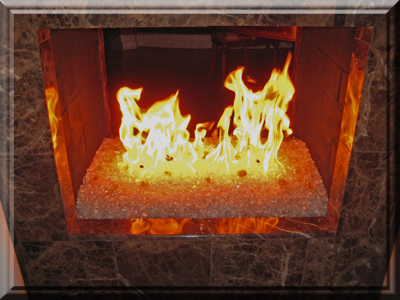 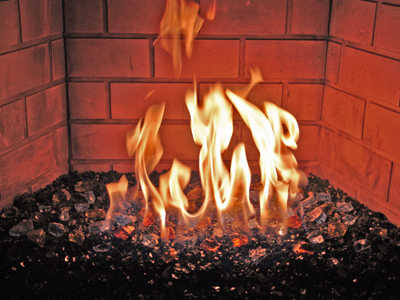 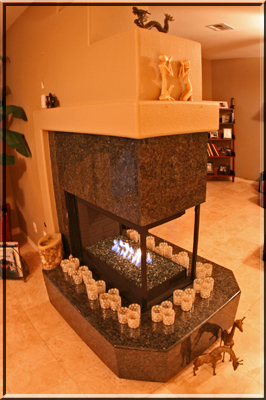 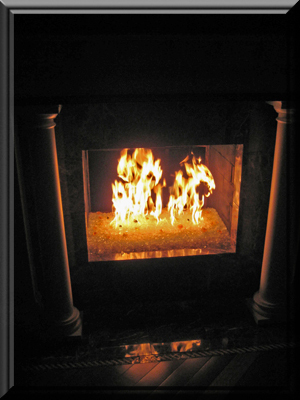 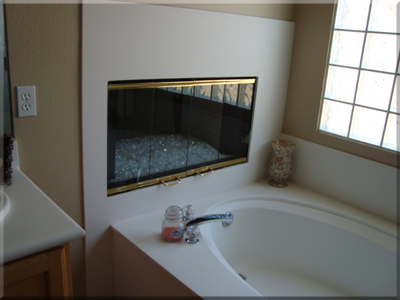 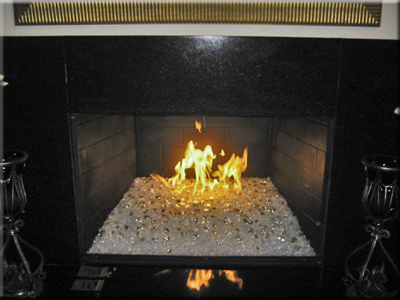 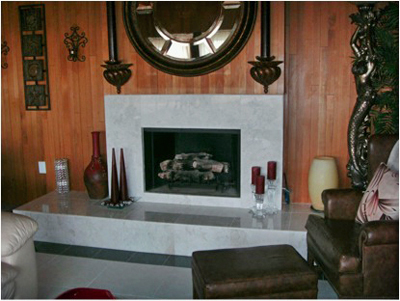 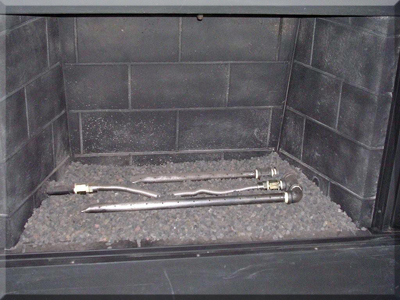 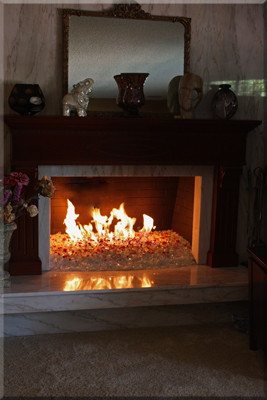 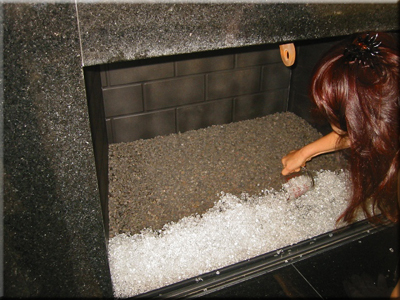 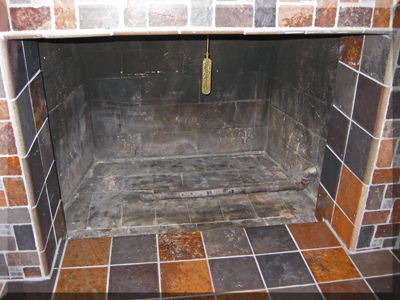 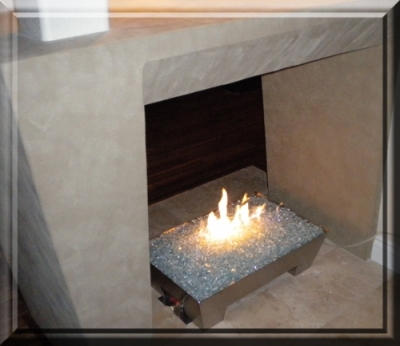 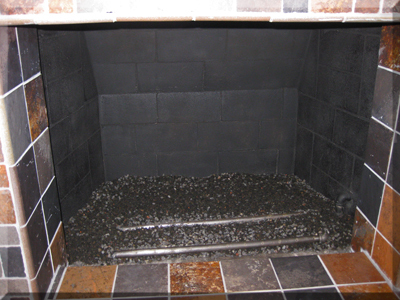 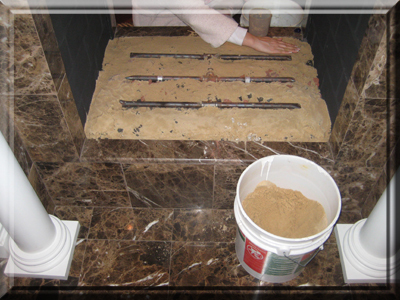 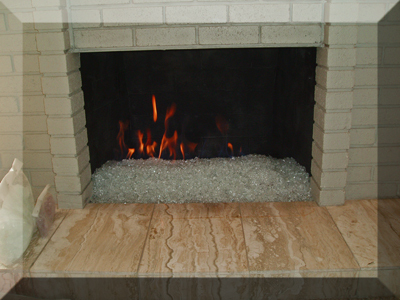 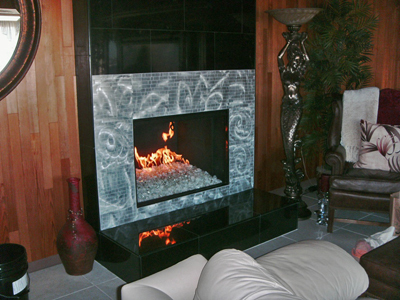 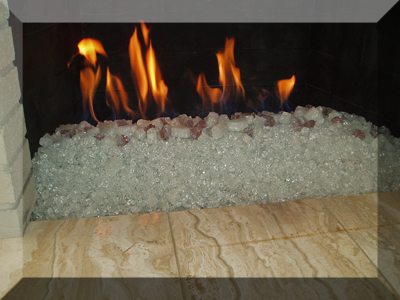 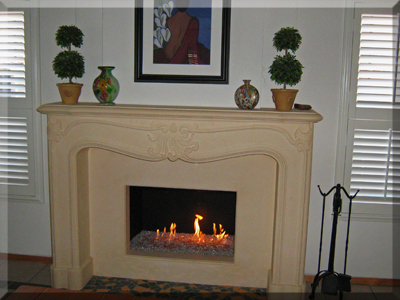 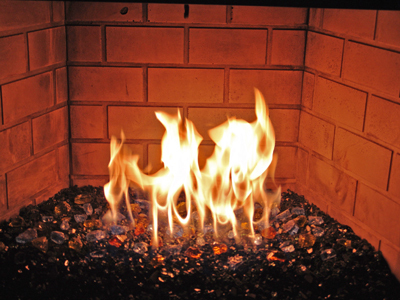 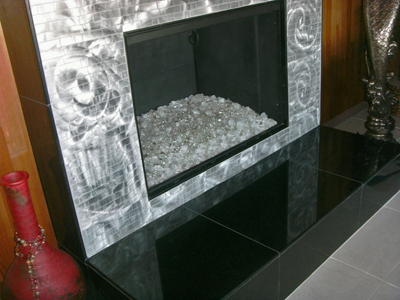 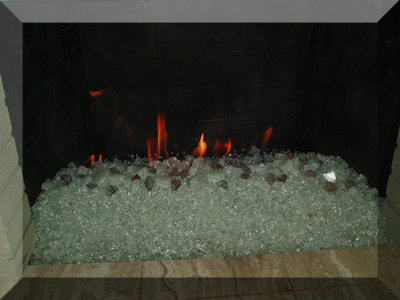 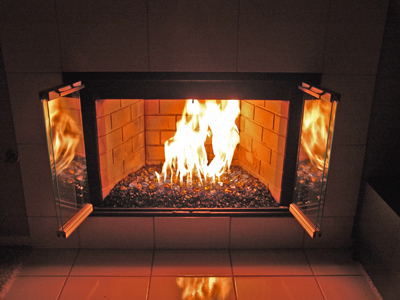 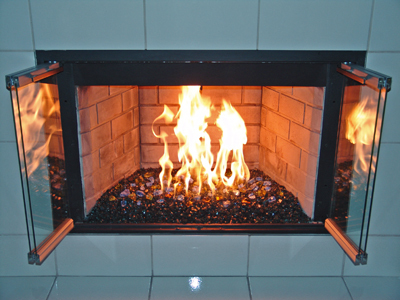 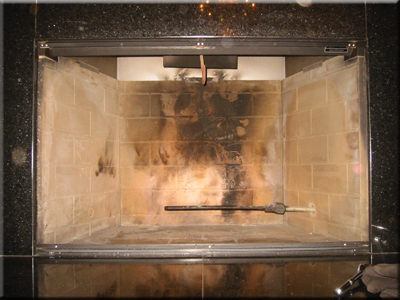 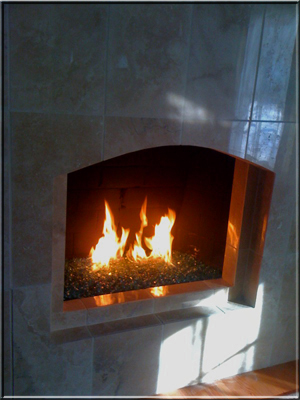 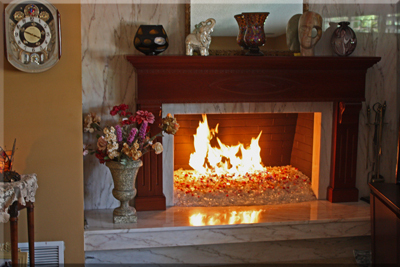 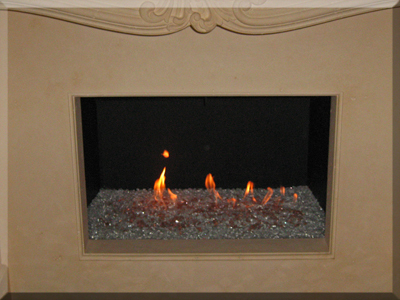 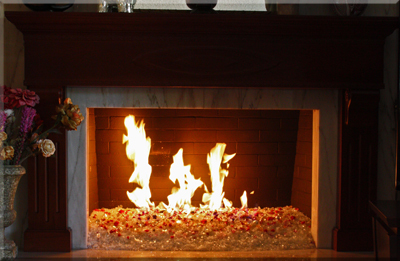 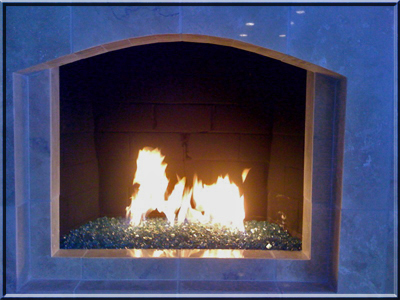 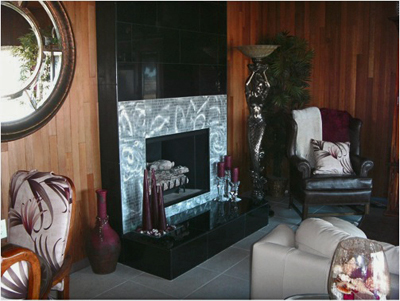 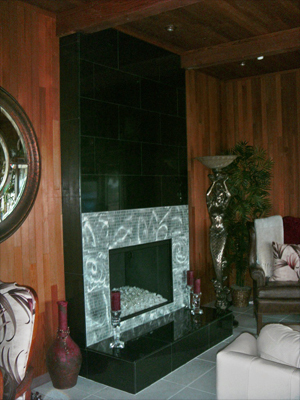 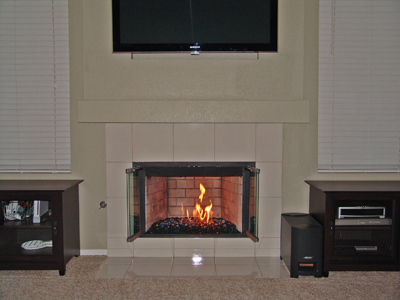 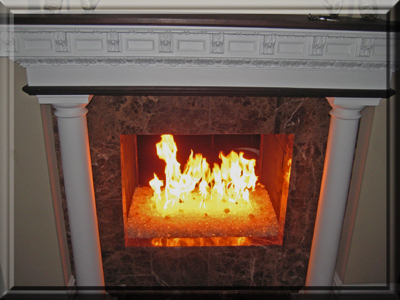 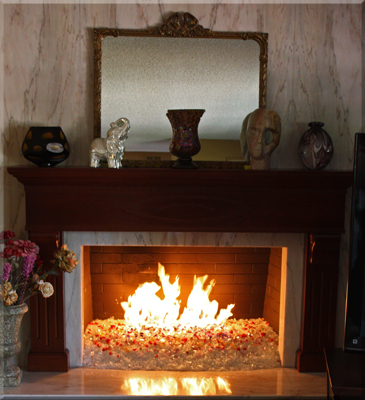 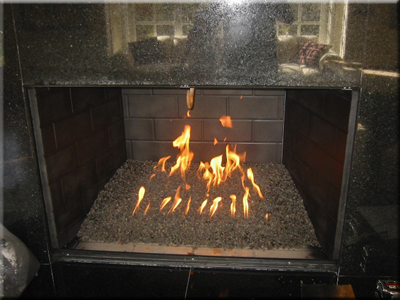 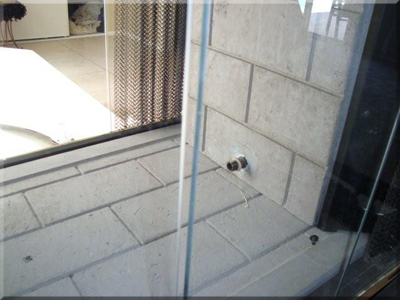 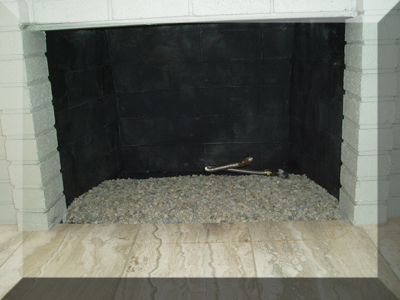 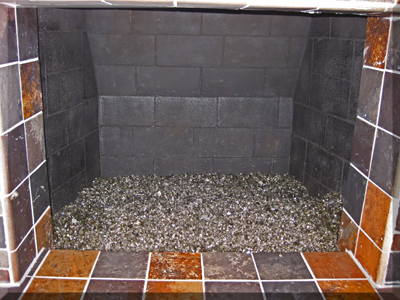 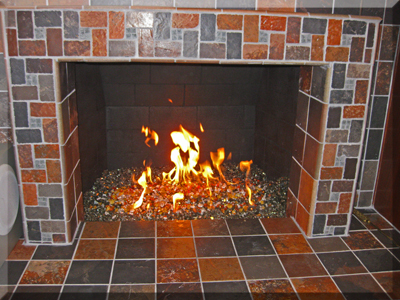 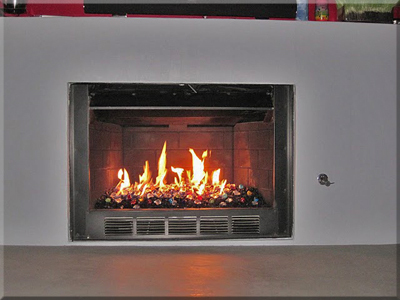 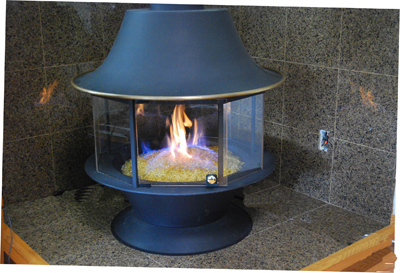 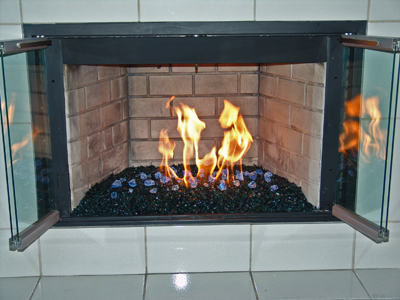 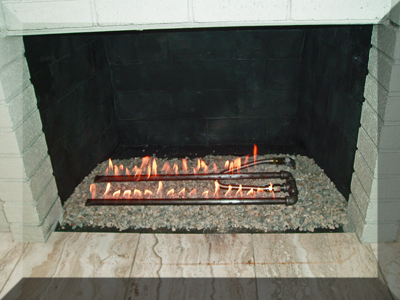 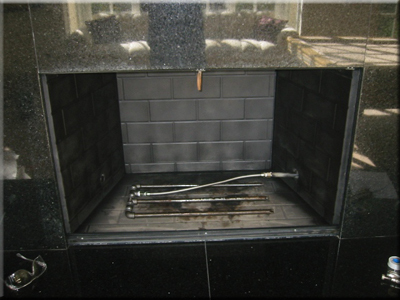 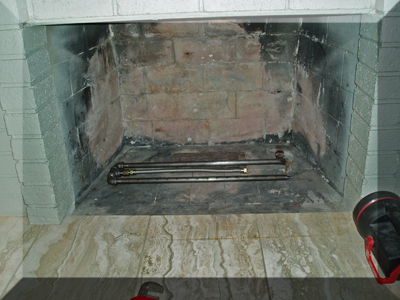 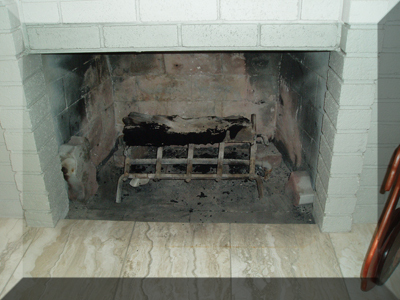 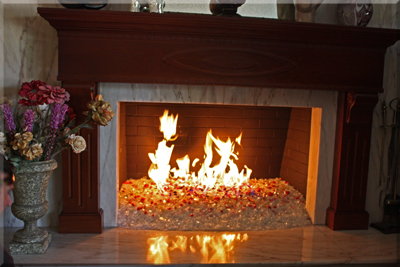 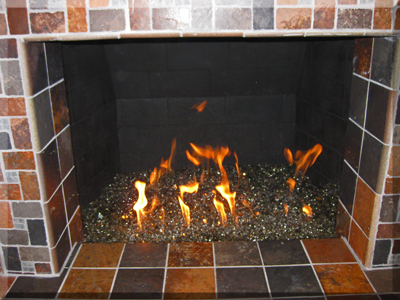 Sev in Las Vegas installed Gray base glass (FireGlass) in his direct vent fireplace. 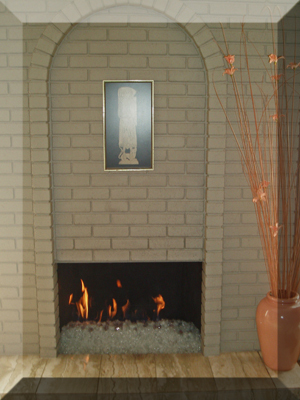 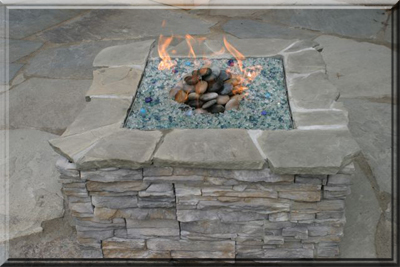 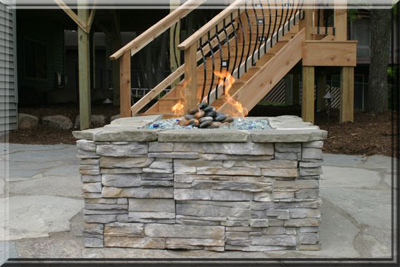 A very simple fireplace design. 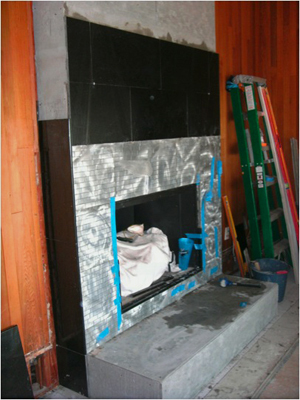 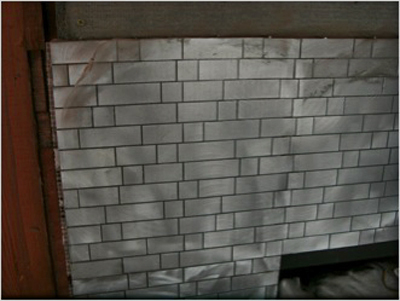 Here are two interesting new style burner pictures! 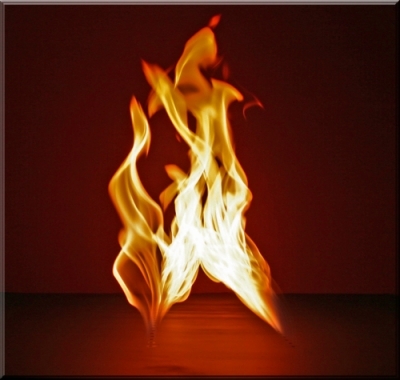 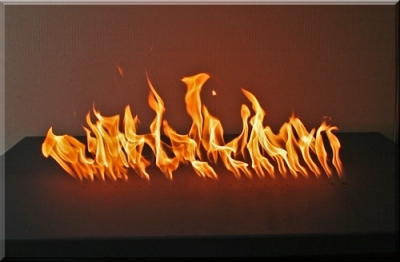 These are floating flames! 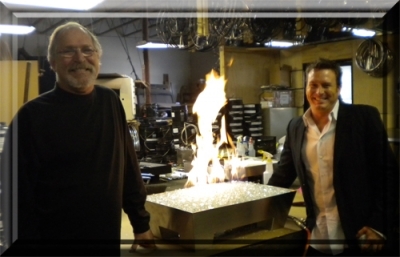 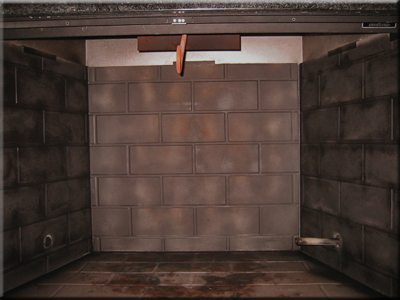 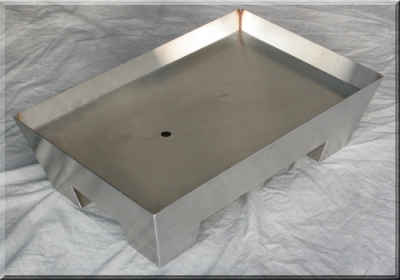 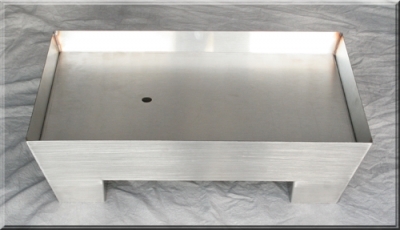 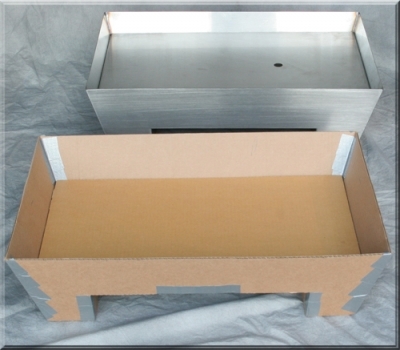 It's our pan burner/ manifold with Floating Flames!See other burners in our "Pans Burners and Baskets" page! 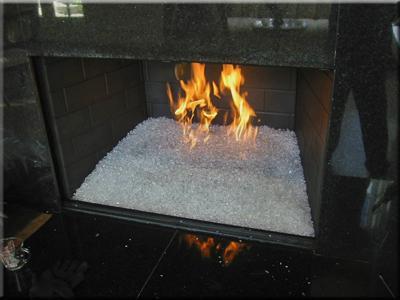 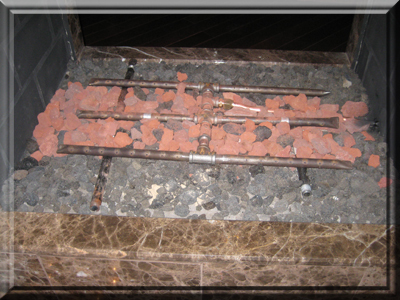 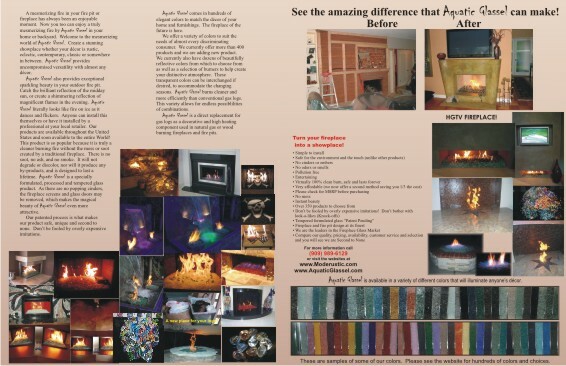 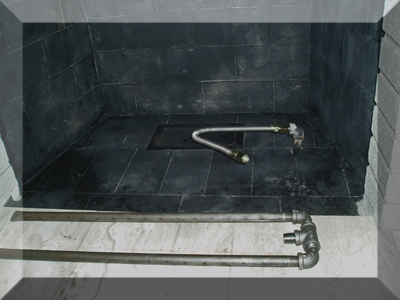 The fireplace pictures below are of a self installation with a crushed lava as a bed and Multi Mix base glass poured on top. 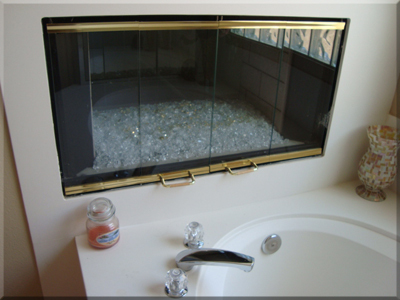 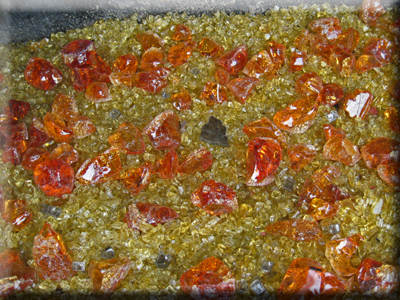 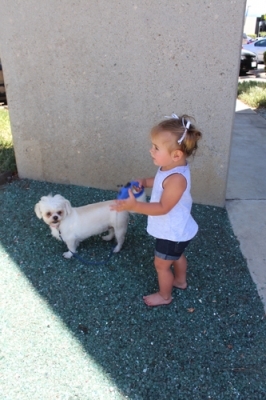 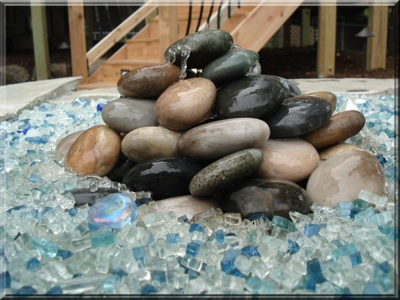 Our Multi Mix base glass is never the same and is usually comes with and up to 100 colors! 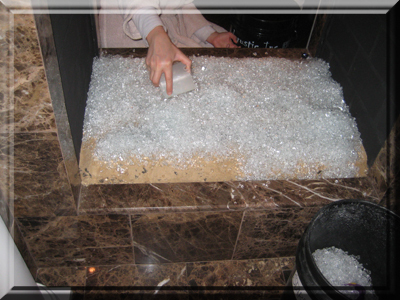 Pour in the glass and your done! 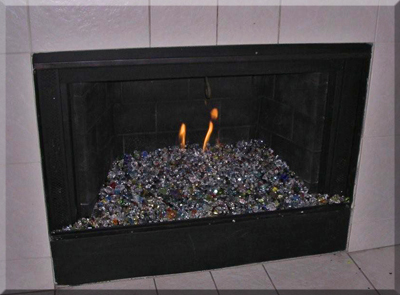 Morris used a Starfire base glass ad topped it with 3/4" Starfire base glass and Rhubarb Topper. 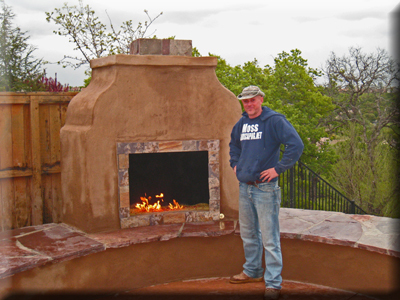 This is Jake Moss who appears on DIY's Yard Crashers as a guest with Ahned Hassan. 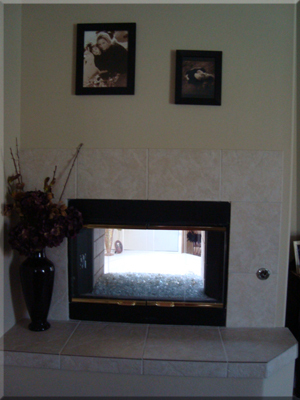 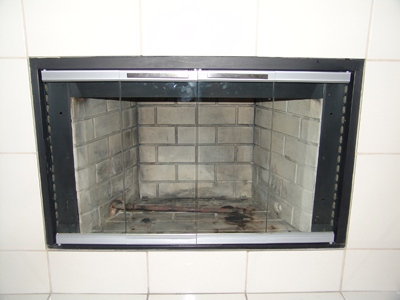 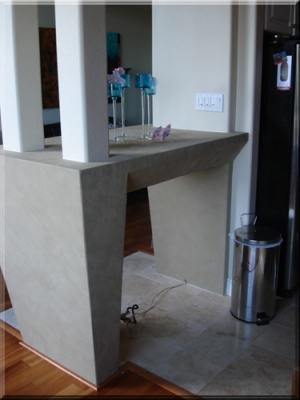 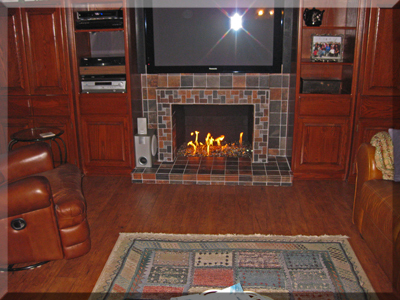 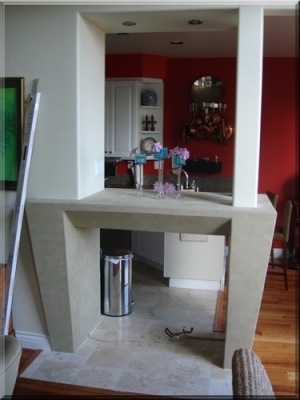 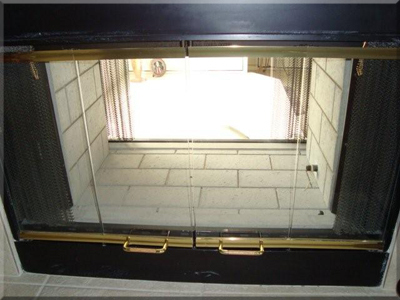 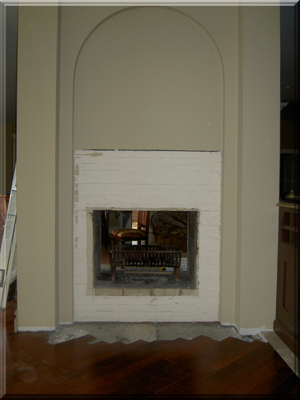 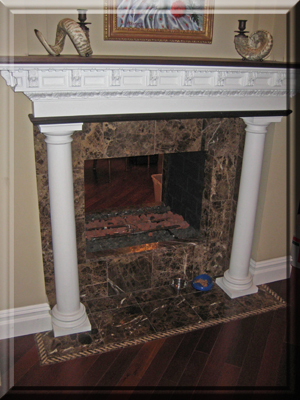 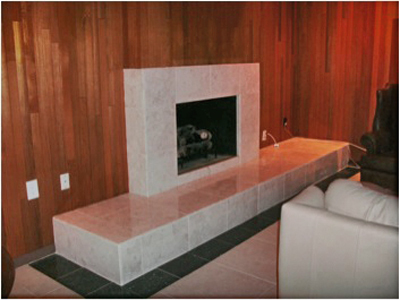 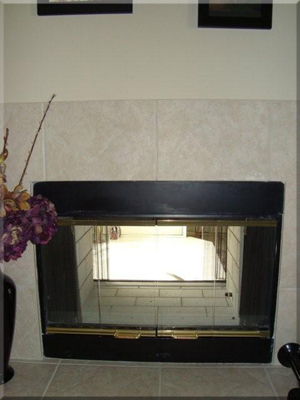 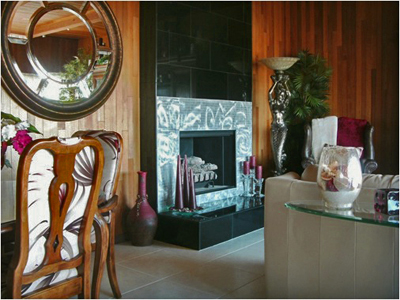 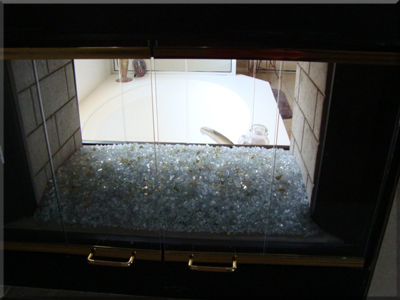 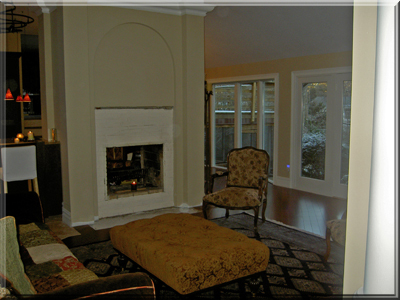 The Fireplace below is a Malm Fireplace with Ambr base glass. 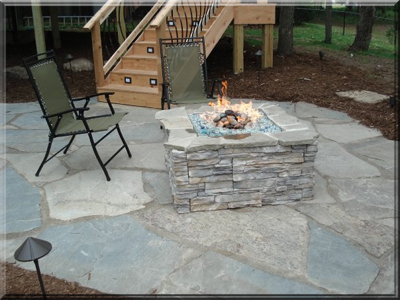 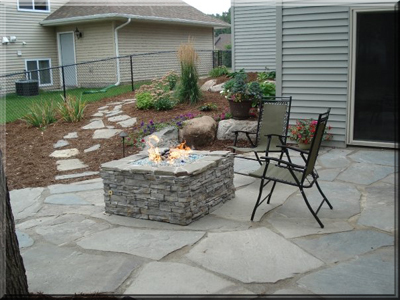 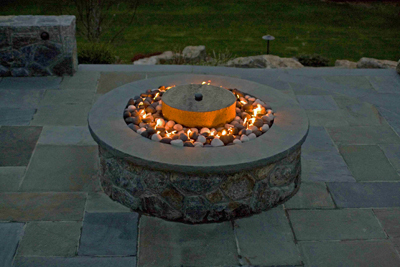 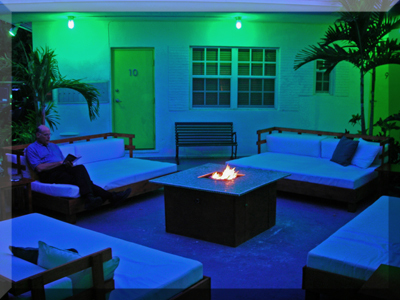 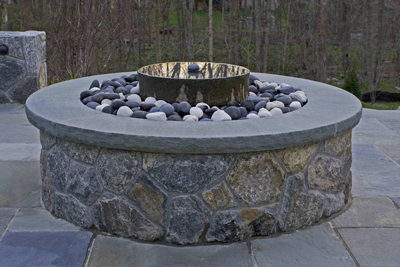 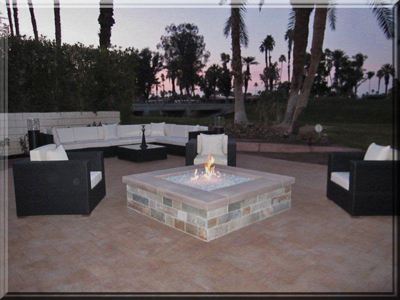 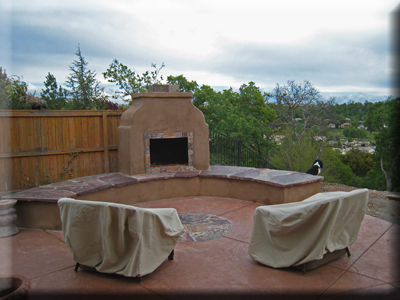 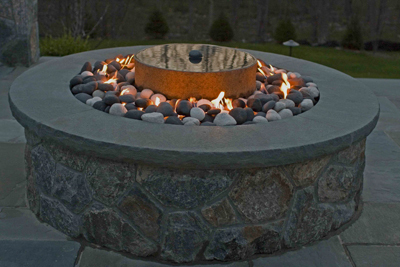 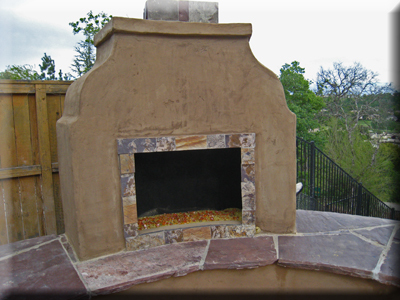 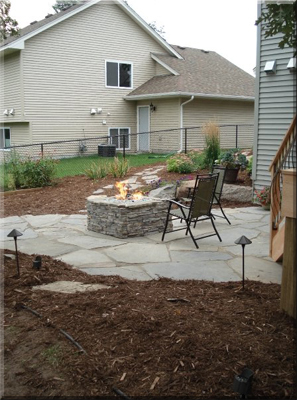 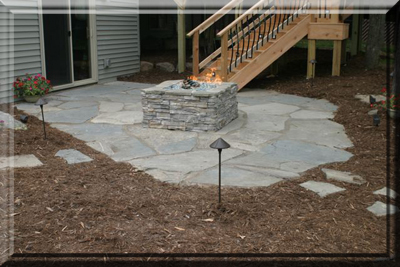 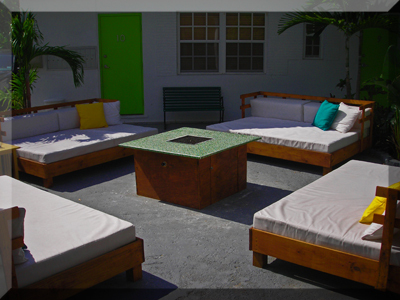 The fire pit below was constructed by Andrew Jordan in Miami Florida, www.BuenaVistaFlats.com. 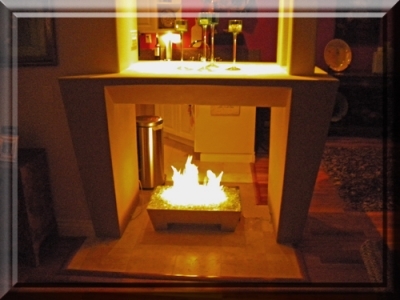 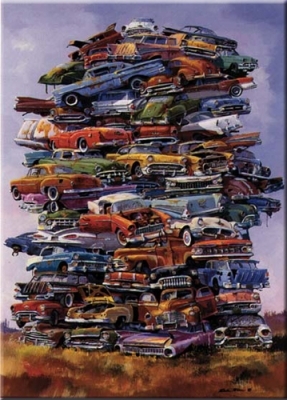 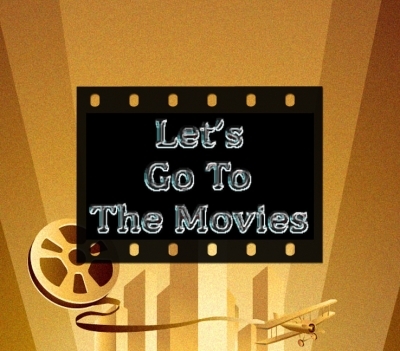 If your in the area, send them a line or stop by www.BuenaVistaFlats.com.